WG recently added support for Team Battle stats to their API, as such I have added support for it to Clan Tools' Player and Clan lookup pages. To stay consistent with what WG reports, Team Battle stats are not included in the "all" stats. Fixed Clan Lookup navigation option in dropdown not correctly redirecting after server selection. 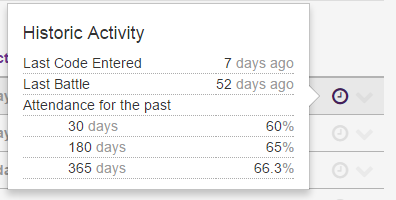 In an effort to make it easier to quickly get an idea of a player's long-term attendance directly from the activity report's page, a historic activity 'tooltip' has been added for each current clan member. Details on the away entries for players who have one, or more, away entries which intersect with the activity report span have also been added. Increased maximum days span to 365. 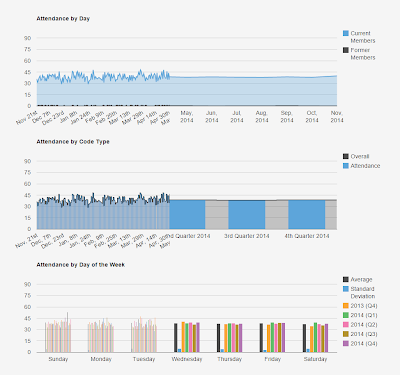 Improved performance when generating report. New clan battles are now checked for every 10 minutes, as opposed to every 5 minutes. 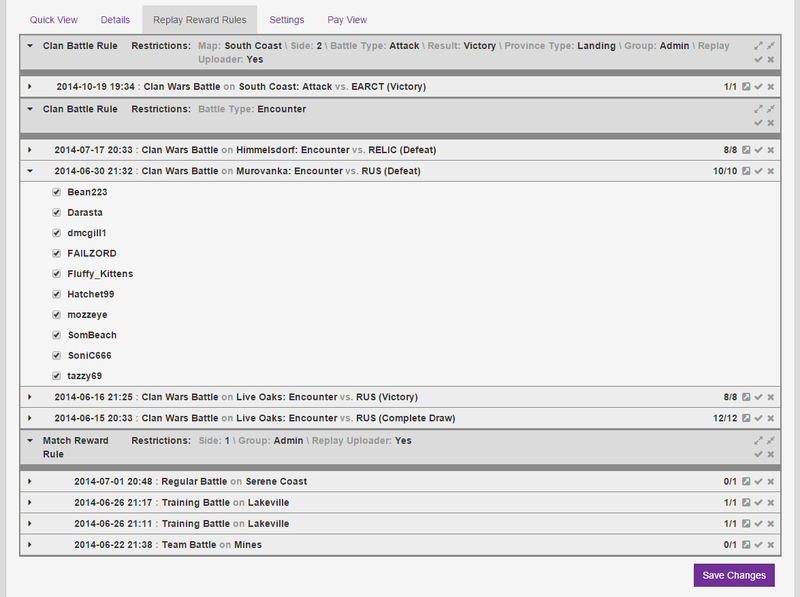 Change payout Quick View and Pay View sorting to match WG's sorting on the clan page. 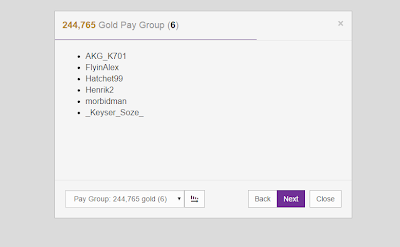 Added clan role separators to Quick View and Pay View player lists to (hopefully) aid in finding users. If anyone happens to know the logic behind WG's user sorting within the same clan rank on the site, please let me know because the current method for determining the sorting order is sub-optimal to say the least. Sorting by the user's unique account ID is close and seems to result in long chains of matching sorted players, yet some are still out of order. For example, on HAVOK's page (http://na.wargaming.net/clans/1000001755/), Flakker2 (1000028741) has players with higher IDs both above and below him. Fixed treasury value not being loaded correctly when a valid API token was available. The quick view was designed with the goal of making it easy to perform payouts by grouping and sorting in a logical way. However, it was far from prefect. In an attempt to improve this, I've added what I'm calling "Pay View", which is designed to be a distraction free, one pay group at a time, view of the information provided by the quick view. Previously replay reward rules were an all or nothing sort of thing, as while in some cases the rewarded players could be filtered either via the replay reward rule's filters, or the linked code type's payout limiters, ultimately there was a large gap in granular control. In an effort to fix this I've added the ability to select the individuals who get rewarded by a replay reward rule per-a-replay, from the subset of players who meet the restrictions for the replay reward rule. See note 1 for more information. Previously replay reward rules (both clan battle and match), in addition to group bonuses, were set globally and could not be adjusted per a payout. This has been fixed. These are treated just like code type payouts in terms of loading from a template. Previously whenever a payout was (re)calculated, the server effectively put you on hold while it performed the calculations, then redirected you once the calculations were finished. This approach is problematic because calculations (or rather saving the results of the calculations) takes a significant amount of time, which has only grown as additions to the payout calculation system has been made, and as such it isn't being used anymore. Clan Battle Roles (CBR) were designed to be a way of tracking players who played key roles in battles, for both statistical purposes and to allow more refinement of clan battle reward rules. CBRs however suffer from the fact that setting them is an inconvenience, and the options for automating their assignment is very limited. As such, I consider CBRs to be effectively worthless in their current state (where they have never been used), and lacking a way to improve CBRs current status in any significant way, the only option I see is to consider them a failed experiment, and thus deprecate them. Considering no one uses them, I don't think this part is particularly necessary, but by deprecated I mean that at present they will continue to work, however at any time they may be removed, so it's highly recommended that clans continue to not use CBRs. I've been trying for some time to find a good way of displaying the, at times, huge amount of fields on some of the editing pages, primarily the Code Type and Payout pages. The expander approach was better than nothing, but I never found it to be "good". To this end I'm trying tabs. I tried tabs out first with the Clan Lookup page, and honestly found them to be great. With expanders you end up with a lot of wasted vertical space taken up with margins, and a lot of scrolling about. With tabs, every navigation header can fit in the same space as one expander's header. Furthermore there's this central point of navigation which allows quickly going through all of the tabbed sections. None the less, I'm always open to feedback both good and bad so feel free to comment either way. Lacking any negative feedback, I'll be looking to move the Code Type editing page to the same tabbed approach. Renamed "Stronghold" replay type to "Stronghold Skirmish", with "Stronghold" now being for the actual attack/def battles (note this is just a name change, it has no effect only any settings). Clan Battle Reward Rules' province type filter now works differently for encounters; previously it only checked the type of the "primary province", which was defined as the province your clan was attacking. 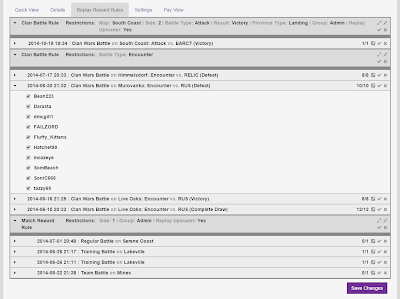 Now it checks both province types and matches on either. Implemented long term fix for the issue relating to an internal server error when uploading some replays. Added "Support Clan Tools" to the bottom of the news feed. Redesigned front-page for users who aren't logged in or aren't a member of a participating clan. 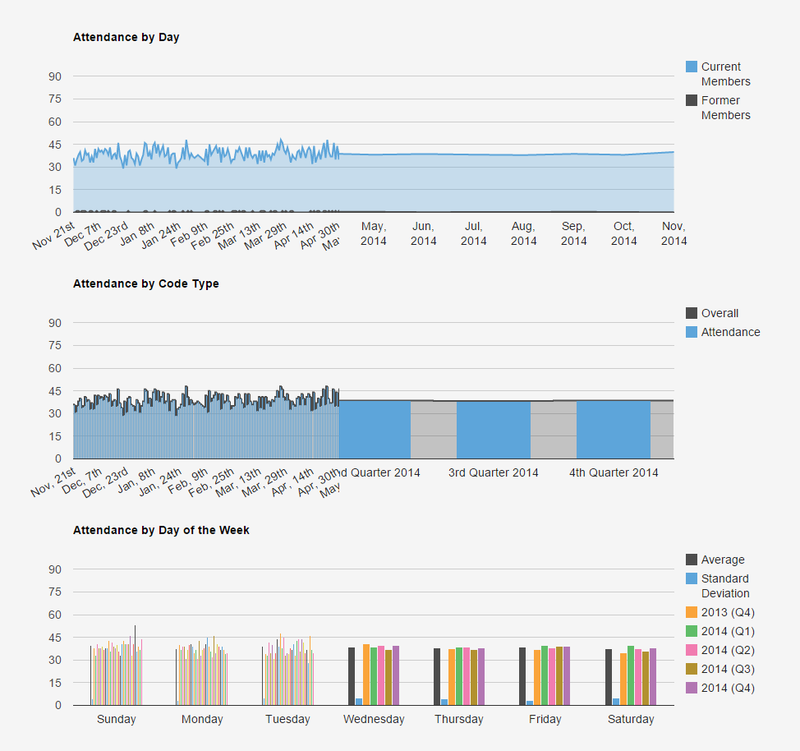 Removed "attendance" from Payouts path and breadcrumb. Added ability to change non-calculation related settings for completed payouts. Updated clan links to go to the new Wargaming.net clans site. Please note, all payout changes are not retroactive; the display of all existing payouts remains unchanged. Additionally all existing payouts are now read only. For completed payouts, this makes no difference. However, for payouts that weren't yet completed, they can no longer be edited or completed. This is necessary due to the significant changes made to the existing payout code. 1. More on replay reward rules list. The tab will be hidden if there are no replay reward rules with at least one qualifying players. Likewise, replay reward rules without any matching players won't be displayed either, as the list of replay reward rules is ultimately a list of players who qualify for one or more replay reward rules, not a list of replay reward rules. If you change a payout reward rule in the Payout editor, unless it's just changing the code type being paid out, it will clear out any existing "unchecked" entries (it actually clears them all). Also, the underlying code works off of unique ID's, not the actual rules, thus deleting then perfectly recreating a payout reward rule will not transfer the settings. Barring any unexpected delays, tomorrow around this time (14-11-13 12:00 EST) I'll be updating Clan Tools. One of side effects of this is that the payout system calculation version has been incremented, and thus at that time any existing payouts that aren't yet completed will effectively become "read only", with the only options being to view or delete the Payout. Completed payouts will continue to be viewable as expected. As always, I'll post a update post and tweet a link to it when the update is deployed, so that's where to watch if you're waiting for the update to do a payout; my apologies if you are. The gap in combatant loading for clan wars battles should be almost gone as WG's API now seems to work as expected for landing/riot tournament information, allowing the loading of battle opponents for those battles. I believe the only gap now is for the defending clan when two or more clans chip the same province, though there may be some related gaps. The way Clan Tools stores all (battle) map information, including battle listings, replays, replay reward rules, etc... has been changed as the old format had issues. Existing entries have been converted to the new format, and thus this change should be completely seamless. If anything seems to have not converted correctly, do let me know; all of the old map data is still being stored for the time being so any issues should be fixable. Match Reward Rules no longer require a match type be selected (thus, match reward rules can now match on any match type). Member's list on Clan Lookup page now sorts the same as the World of Tanks page. Replays with observers can now be uploaded. Battle list should now use regional timezone to determine which battles occurred on a given day (on the NA server, a battle at midnight Eastern Time is still considered to be for the previous day, as the NA server's regional timezone is Pacific Time; this is to ideally insure that days are the logical). Improved JS Error reporting reliability. Issue that would cause JS errors occurring before the DOM was loaded from being recorded. Removed unused "Has Replay" selector on Search Match Replays page. Match reward rules ignoring selected match type. I've been looking at the payout system to see about adding more granular control of who gets paid for what. For example, replay reward rules are very much all or nothing; there's no easy way to single out a single player. At present only code entries, to a degree, have this degree of control (via revoking entered codes). Additionally, replay reward rules and group bonuses, unlike code type payouts, aren't customizable on the per a payout basis, which isn't acceptable.